LinkedIn is the world’s largest professional networking site with more than 560 million users, making it the go-to social media for job seekers and job recruiters. 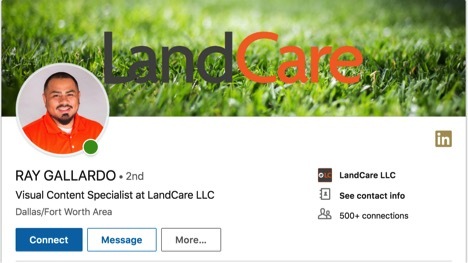 If you’re looking for management candidates to help you grow your landscaping business, LinkedIn is a great place to create new relationships. Here’s a hint—it’s not just about posting jobs. These candidates probably aren’t actively seeking a new job because they’re already employed. Use these tips to stand out and get their attention. No matter how long you’ve been using LinkedIn, take a good look at your public profile. This is the first thing potential recruits will see when they discover you. LinkedIn profiles with professional headshots get 14 times more profile views. 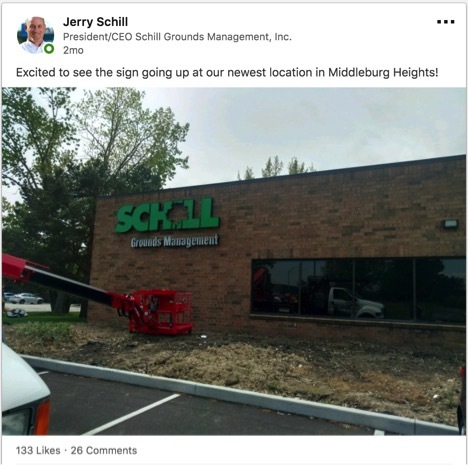 Try taking a photo outside near great landscaping. Avoid using grainy or hard to see pictures. Don’t choose a photo with other people in it. Never use your company logo. Bonus points if you can get your entire team to use the same staged photos. It will help with brand recognition. Along with your headshot, incorporate a background header for your profile page. LinkedIn occasionally changes the dimensions for their site, so a quick Google search of “what size should my LinkedIn header photo be?” will tell you the exact dimensions to make your photo so that it doesn’t get cut off. Your headline is what shows up directly under your name when people search and will be what they use to determine whether or not they want to click through. Take this opportunity to stand out. You can use up to 120 characters in this space to creatively engage potential new recruits. Since your headline is searchable, use keywords that people might be searching when looking for a new career. Your descriptive summary is arguably the most important piece of real estate on your personal profile. This biography of you is where people can find out about what you do, who you serve and the unique benefits of working with you. Your summary should be personalized to you, which means write it in first person using a conversational voice. You’re allowed an extensive 2,000 words in this summary, so be sure to give the reader a call to action on what they should do next. This could be sending you an invitation to connect request, visiting your website, reaching out for networking purposes or applying for a career on your careers page. You also can now add rich media content within your profile. Take this opportunity to show photos of your team at work and video testimonials. Once your personal profile is setup, it’s time to start guerilla marketing. The next tips will be ideal if you’re looking to find an employee who is likely already employed, but may not be actively seeking a new career. LinkedIn allows you to search by job title, keywords, location, schools, industries and more. With the new interface, the “Advanced Search” button is removed, but it’s still possible to use. Here’s how. Search for potential employees by a past or current employer who may have employed people with the skills and experience you seek for your company (aka: your best competition). Then, you can contact these candidates directly, using LinkedIn’s introduction requests and InMail. In your InMails, be courteous, spell your recipients’ names correctly and personalize your messages. Template emails can save time, but it’s best to personalize your messages to speak directly to the passive candidate you’re attempting to recruit. Read up on their work, mention one of their accomplishment and keep your message brief—no more than 100 words. Sharing enticing content can help you be seen as an expert, which will build up your personal brand and make your job as a recruiter a little easier. Create your own original content displaying the uniqueness of your company and combine it with shares from other industry professionals. Giving shout outs is a great way to build social and professional relationships. You can now also post live videos from LinkedIn mobile which could be a great way to share the work you’re in the process of doing and ask your connections to share it with people who might want to get involved. Check out this article by my good friend, Jeff Korhan on how to use audience engagement to understand the value of comments vs. likes. If it makes sense, stay in touch with former colleagues for potential future employment. People who have worked successfully for you or with you in the past could be your best future employees—or may send you your best future employees. A quick inbox message asking them if they know of anyone who would be good for an account manager position may be all it takes. Don’t fret if you don’t receive a response from someone. Check back in your outbox and look for the read receipt. LinkedIn will let you know if they’ve seen your message. Sometimes, people forget they have LinkedIn and only check it periodically, especially if they are satisfied with their job. In this case, try different avenues to reach them, like a handwritten card, Facebook message or a phone call. Consider asking the leaders on your team to search their networks as well to reach out to potential passive candidates for jobs. Employee referrals are typically the best approach, because they recommend people they want to work with. You can make it easy by providing them with a prewritten template. On the free version of LinkedIn, you can send limited InMail to people who are not your first-degree connections for free. But, then there is a charge. A good work-around to do this is to use LinkedIn Groups. Once you find the profile of someone you want to recruit, scroll down to the bottom to see what groups they belong to. If you happen to be in the same group, that is a great place to connect with them on a mutual playing field. If you’re not in any similar groups, you can always join a group they’re in. You are allowed to connect directly with people in the same group. You also can send messages to users who are not connections but are members of a group you belong to, too. Don’t forget, you can post job opportunities in relevant, local groups. LinkedIn Recruiter and LinkedIn Recruiter Lite are subscription services that offer more InMails, and greater access to candidates—beyond what you get from posting paid jobs. The details of what they include are always changing, but from my experience Recruiter Lite has been more than sufficient in meeting my needs. Daily search alerts when targeting candidates for an open position. Good recruiting isn’t just about posting jobs. It’s also important to build your company brand AND personal brand to connect with passive candidates. Strong branding opens the door to better hires, shorter time to fills and better retention rates. 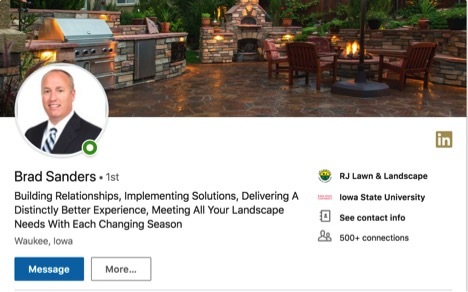 Dowell is the owner of Keldo Digital and the creator of “Recruit Like a Pro For the Green Industry Online Course.” She uses technology to develop sales, marketing and recruiting solutions for lawn and landscape business owners and specializes in working with companies who are trying to scale. For a free recruiting analysis with Dowell, complete this form.